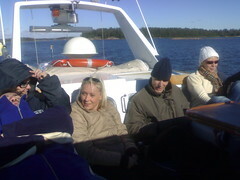 Bård & Susanne have been visiting Helsinki this weekend with their partners Line & Stefan, and we went for a cruise to Stora Herrö (a small island south-west of Espoo) in Pekka’s family’s boat. The set of photos from the cruise are here. 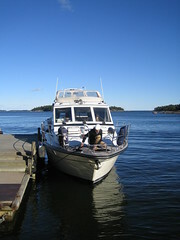 We’re off on a cruise to Stora Herrö, a small island off the coast of Espoo. Last weekend we were in Cornwall for my brother Gareth’s wedding. 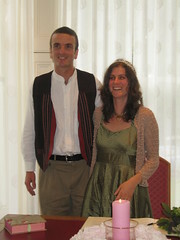 The registry office part was done very well – definitely a sense of a shared marking of a significant community event. The Apache wedding prayer was a very well-chosen addition. Then we had the dinner back in Keveral‘s visitors’ barn. It had been decorated beautifully, and the dinner of stuffed peppers was delicious – you can always count on good, wholesome food at Keveral. Then in the evening there was a party with music, food & drink, and lots of people having a lot of fun. If you’d like to see photos, see Eve’s selected photo set, or all her photos if you’re looking for the one where you’re smiling :-). If you were there and also put some photos on-line, please leave a link to them in a comment on this post. 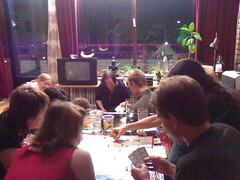 Last Tuesday we had another board games evening, this time at Iris’s place in Vantaa. I’m afraid I didn’t record all the games that were played; I’ll try to get back into the habit of doing that. At least we finally played Save Doctor Lucky (not bad, and it finished with a climax as the ship nearly sank before he was saved). The first weekend of September was Eve’s last chance to get to a summer cottage before the summer was truly over. 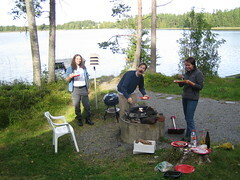 We rented together with Michael & Sabine & Scott (sadly Séverine couldn’t make it) a cottage out in the countryside, and had a very fine time barbequeing and sauna-ing. The water was rather cold, but that’s all part of the fun :). 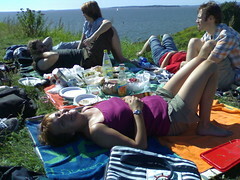 In late August we went with Michael & Sabine and Scott & Séverine to Suomenlinna for a picnic, on what looked like it might be the last sunny weekend of the season. It was lovely to just sit out in the sun for a while, and we had plenty of fine things to eat and drink. Afterwards we stopped at Suomenlinnan Panimo brewery pub, where four years earlier Eve & I got married.